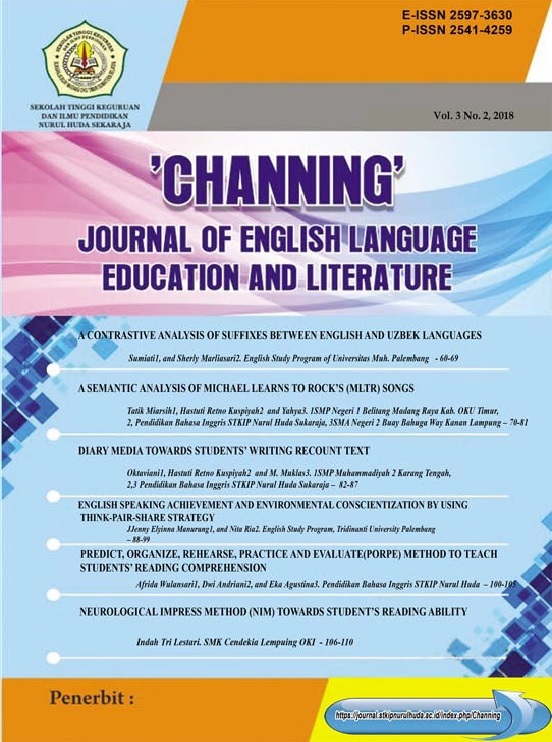 The problem of this study is "is it effective using PORPE method to teach reading comprehension at the seventh-grade students of SMP Pangudi Luhur Santo Aloysius Sukaraja OKU Timur?". The objective of the study is "to find out whether or not PORPE method is effective to teach reading comprehension at the seventh grade of SMP Pangudi Luhur Santo Aloysius Sukaraja OKU Timur." In this study, the pre-experimental method was used. The population is all of the seventh-grade students of SMP Pangudi Luhur Santo Aloysius Sukaraja OKU Timur, with the total number of the students 30 students. The sample is 30 students taken through saturated sampling consisting of 30 students as the sample. Based on the description, it could be seen that the result of students pre-test the average score was 5.01 and the result of the student's average score in post-test was 8.01. The result calculation of the matched t-test was 5.45. the t-obtained was higher than t-table 1.699. It means that Ho was rejected and Ha was accepted. In another word, the result of the study showed that it was effective teaching reading comprehension by using PORPE method at the seventh-grade students of SMP Pangudi Luhur Santo Aloysius Sukaraja OKU Timur. Abidin, Y. (2012). Pembelajaran Membaca Berbasis Pendidikan Karakter. Bandung: Refika Aditama. Aebersold Jo and Mary Lee Field, From Reader to English Teacher, Cambridge : Cambrigde University Press, 1997. Arikunto, Suharsimi.(2010). Prosedur Pengkajian PENELITIAN Suatu Pendekatan Praktek. Jakarta: Rineka Cipta. Clark and Silberstein, D.(2008). Reading Comprehension Strategies for Independent Learners Second Edition. New York: The Guildford Press. Nugraha, Aditya.(2011). The Use of Reciprocal Teaching to Improve Students’ Reading Comprehension A Classroom Action Research at The Eighth Grade of SMP Negeri 19 Surakarta In 2007/2008 Academic Year. Thesis. Accessed 10 novemeber 2015, time 20.00. Robimett. (1998)., as cited in Anggun Mona Putri (2015). The Effectiveness Group Investigation (GI) to Teach Reading in Descriptivr Text at The Eighth Grade og SMP Negri 1 Kec.Buay Madang Kab. OKU TIMUR. Thesis. Putri, Mona.(2015). The Effectiveness Group Investigation (GI) to Teach Reading in Descriptivr Text at The Eighth Grade of SMP Negri 1 Kec.Buay Madang Kab. OKU TIMUR. Thesis. Simpson, M. L. (1986). PORPE: A writing strategy for studying and learning in the content areas. Journal of Reading, 29, 407-414. Nugraha, Aditya.(2011). The Use of Reciprocal Teaching to Improve Students’ Reading Comprehension A Classroom Action Research at The Eighth Grade of SMP Negeri 19 Surakarta In 2007/2008 Academic Year. Thesis. Accessed 10 november 2015, time 20.00. Sugiyono. (2013). Metode penelitian kuantitatif ,kualitatif dan R&D. Bandung: CV. Alfabeta. Putri, Anggun M. (2015). The Effectiveness Group Investigation (GI) to Teach Reading in Descriptive Text at The Eighth Grade of SMP Negri 1 Kec.Buay Madang Kab. OKU TIMUR. Thesis.